Posted March 11, 2015 by Coláiste Bhaile Chláir in Features. 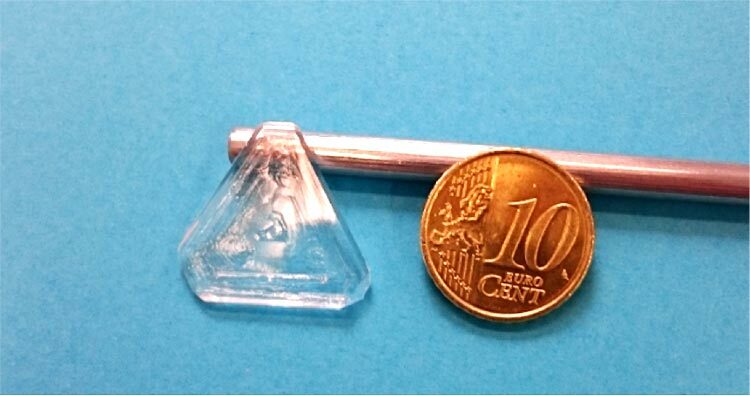 The Synthesis and Solid State Pharmaceutical Centre (SSPC) announced they were hosting a crystal growing competition as part of the International Year of Crystallography. 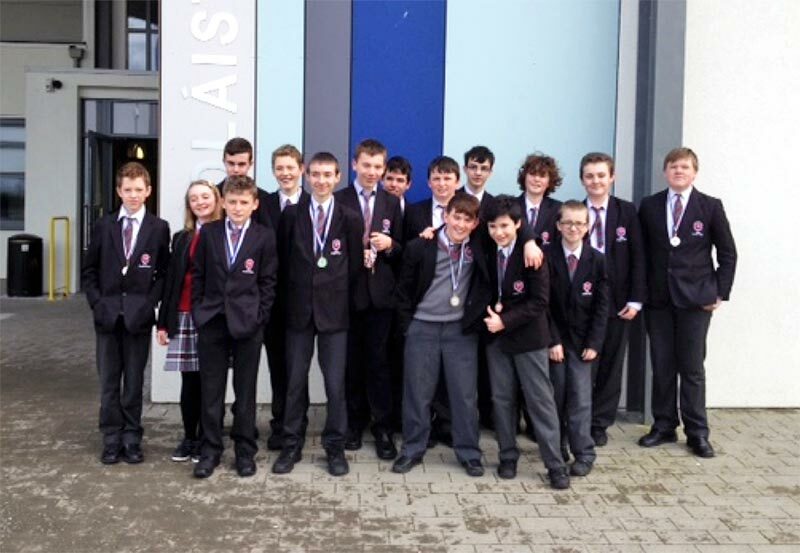 A number of students at Coláiste Bhaile Chláir rose to the challenge. They researched their topic on the internet and each group came up with an experiment plan. 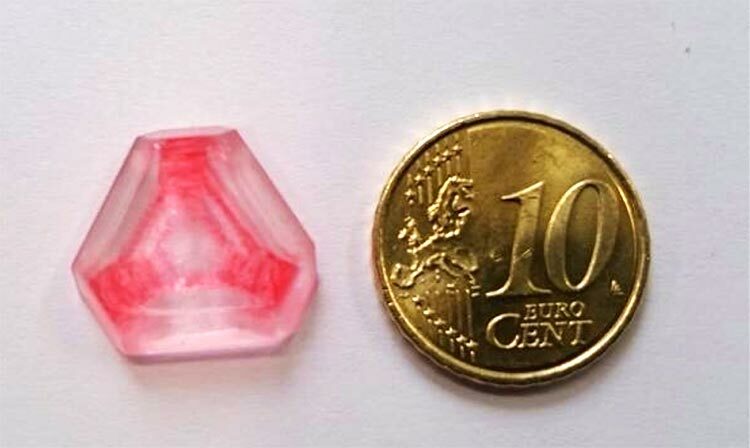 They spent weeks’ worth of lunch breaks in the laboratory growing seed crystals and painstakingly tying fishing line to these small structures to allow for further growth in solution. All groups succeeded in growing impressive alum and/or copper sulphate crystals. Jason Folan’s Award winning crystal. Dr Sarah Hayes of the SSPC said, “The overall quality of the classes contributions was exceptionally high! 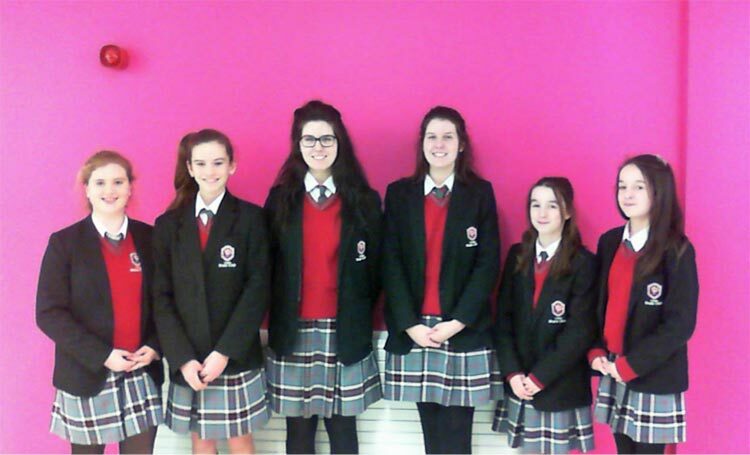 They were competing with 5th and 6th years in some cases and still did so well!” Results which were announced on Friday 17th of February revealed that the competition had two joint first place winners, including Coláiste Bhaile Chláir’s own first year, Jason Folan. Oisín Tobin first year was runner-up with another excellent crystal. Jason has won an iPad mini and Oisín a pair of Dr Dre headphones. 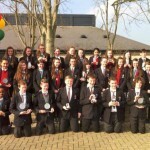 The SSPC has invited the whole class down to SSPC at the University of Limerick during March for some good science careers talks and to present them with their prizes. 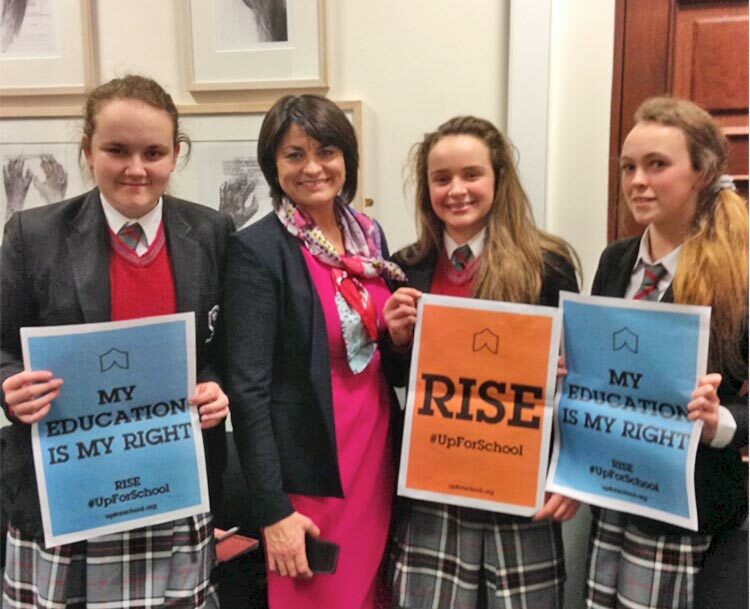 Last Friday Katie, Andrea and I attended a meeting in the centre of human rights building with our teacher Ms Egan in NUIG to show our support for the launch of #UpForSchool. People have taken a lot of time to set this up and now it’s our turn to help them spread the word and get it started in our own area! The previous day to the meeting, Irish politicians from various parties showed their support for the campaign outside the parliament at Leinster House in Dublin—ahead of the official #UpForSchool launch in Ireland on February 27th. Katie Westbrook, Senator Healy Eames, Andrea Trill and Jade Sweeney. Up For School are trying to create awareness and tell people that every child has the right to go to school, without danger or discrimination. But there are children who can’t attend school because they are in danger. Girls can be attacked just for trying to go to school. It is over six months since the schoolgirls of Chibok in Nigeria were abducted by Boko Haram on April 14th. You can show your support for them—and for all children to go to school without danger or discrimination—by signing the #UpForSchool Petition, this is a global petition to eliminate barriers to education and learning. Help create a message no government, politician or leader can ignore and demand that every child can go to school safely. Nothing changes without pressure. Sign the #UpForSchool Petition. Act Now. We, the world’s youth, teachers, parents and global citizens appeal to our governments to keep their promise, made at the United Nations in 2000, to ensure all out-of-school children gain their right to education before the end of 2015. We are standing up to bring an end to the barriers preventing girls and boys from going to school, including forced work and early marriage, conflict and attacks on schools, exploitation and discrimination. All children deserve the opportunity to learn and achieve their potential. In just five months, three million people around the world have signed the #UpForSchool Petition. Every day, on average, 20,000 people add their name to the #UpForSchool Petition. That’s fifteen people every minute taking the time to sign their name demanding action from world leaders. But we need even more to reach the target! If we could get all the pupils from our secondary school, the primary school and all the local people in the Claregalway area we could really help children who want an education, and all it takes is one minute of your time to do that! So don’t waste a second thinking about it—sign the petition! Share on Facebook/Twitter and tell all your friends and family to help get as much signatures as possible so #UpForSchool can reach their target and give the right to education to children all around the world! Education is the light of our future. Tá gach duine i gColáiste Bhaile Chláir ag súil go mór le seachtain na gaeilge. Beidh imeachtaí de gach saghas mar shampla ceol tradisiúnta agus damhsóirí, tráth na gceist agus cluiche bíngo ar siúl. Beidh céilí mór ar siúl ar an Áoine lenár gcuairteoirí ón Spáinn. Beidh comórtas éalaine agus comórtas cócaireacht ann chomh maith. Beidh gach duine ag labhairt gaeilge sa scoil an seachtain sin agus ag baint taitneamh as an bhFéile. Stuart was blinded at birth by a tumor that formed on his optic nerve. The surgery that was done to remove the tumor blinded him. The presentation started off with Stuart introducing himself and Frances McGrath from NCBI. He talked about his childhood and how it was growing up. Stuart went to a boarding school for the blind from age 6, where he was taught how to read braille and use a brailler, which is a typewriter for the blind that types out braille. Stuart had said it was a big change going from a school for blind to just a normal school. It was challenging for him to often hear children talking about colours and trying to describe them to him, but he was never able to quite grasp what they were. Someone had once tried to explain what blue was and told him “It was the sea.” Stuart said it’s the closest he’s ever come to knowing what the colour blue is. When Stuart first started college he did a course on using guide dogs. There were about five or six others doing the course with him but he was the only one who had been blind since birth. He talked about how those others often wanted things to be described to them. For an example when a movie was put on, there was a person giving a run through on what was happening and said “A girl’s getting out of a car,” and a man quickly yelled “Describe the girl.” Stuart never really understood why he needed her to be described or anything else for that matter. He said it didn’t matter to him. He felt that those losing their sight at some time in life meant they knew what they were missing while he didn’t. He and Frances showed us two different types of canes. A normal cane used for the blind and a symbol cane to say ‘I have low vision’. He said not many people are completely bind and that most often have some vision. He also showed us how he uses his IPhone to send texts, read emails and more. Stuart said that he lives his life as normal and that sometimes things may be challenging to him because he is blind but he doesn’t let it stop him. The presentation was a great experience and I felt lucky to get the opportunity of having Stuart come in as a speaker. 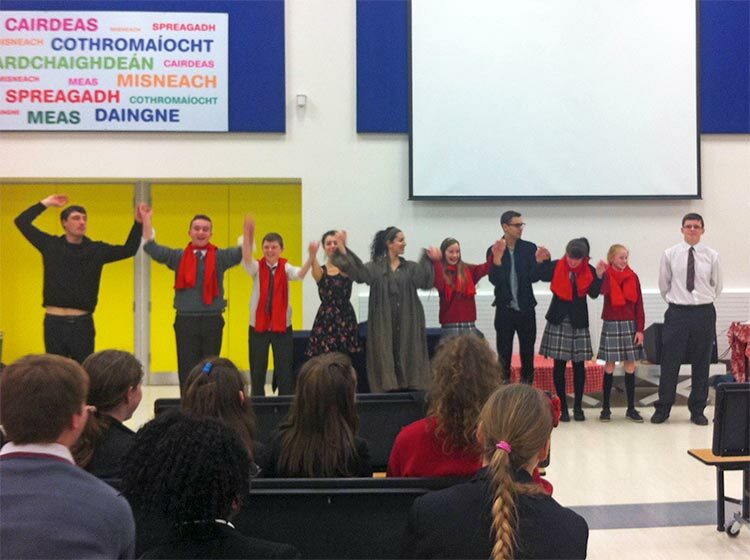 The French Theatre for Schools visited Coláiste Bhaile Chláir in February for an interactive language show for all first and second year French students. The entire performance was through French and students were invited to get involved and practice their language skills. This very entertaining show was an excellent way for students to meet some native speakers and practice the target language. Coláiste Bhaile Chláir are once again competing in the Mathletes challenge, Students from fourth to sixth class in primary school and first to third year in secondary school junior cycle are eligible for the 2015 Challenge. 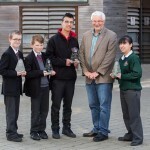 Students compete online through the Khan Academy website, and face to face against their peers, with over €20,000 in prizes and the title of Mathletes Challenge All-Ireland Champion on offer. Ciarán Cannon TD and Isaac Burke NUIG present the Mathletes trophies to top first year students Daire Leonard and Sinéad King. Students can participate individually in the Student Challenge and/or with their school in the School Challenge, with top scorers advancing to county, provincial and national finals in May. We got off to a great start winning the overall secondary schools award and points per eligible student award for January. 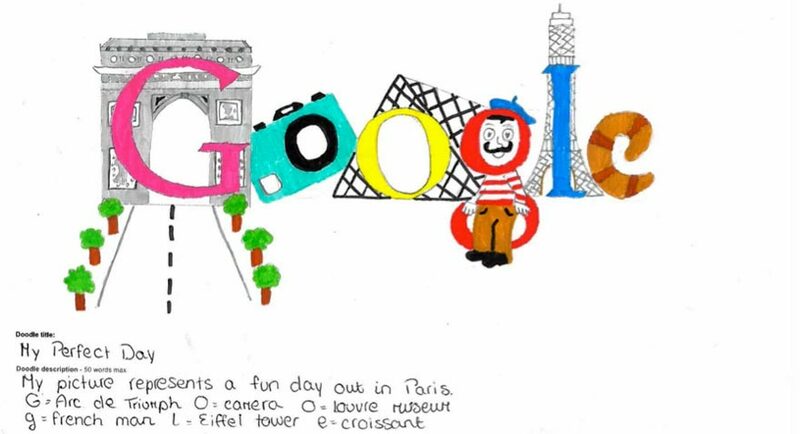 Coláiste Bhaile Chláir is delighted to announce that two first year students, Emily Wall and Emma Malone have qualified as a Doodle 4 Google 2015 finalist with their doodle designs based on the theme My Perfect Day. Emma and Emily have had their designs selected from thousands of students around the country, with only fifteen designs making it through to the finals for their age category: 1st years, 2nd years and 3rd years, which is a huge achievement for our young students. 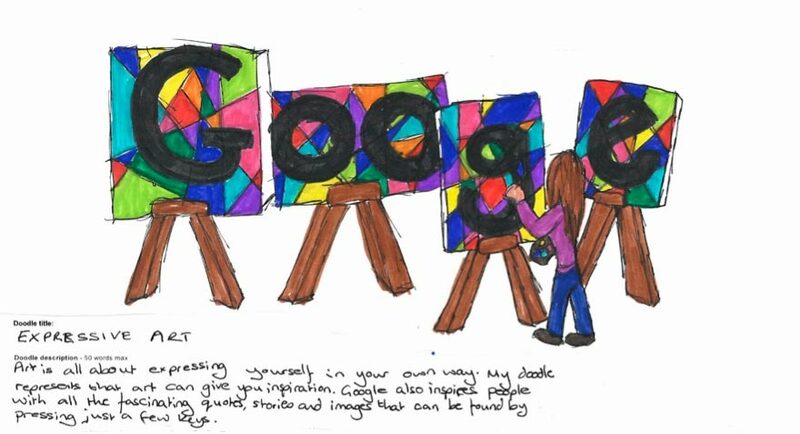 The competition involves public voting which opens on March 9th and we have until March 20th to get as many votes in as possible for one of our students to be selected as category winner and then overall winner of the 2015 Doodle 4 Google competition, with the winning design taking over Google’s homepage for 24 hours. To vote: log onto Doodle 4 Google 2015 and cast your vote for Emily or Emma’s doodle. They are two extremely talented and hardworking students and we wish them the very best of luck! Coláiste Bhaile Chláir were represented in the Connacht School’s Athletics Final by four teams. Minor and Junior Boys and Girls teams. And they’re off! Start of the Junior boys race at Sligo racecourse. The finals were held at the racecourse in Sligo on Wednesday the 25th of February. Despite the very wintery conditions, muck and wet the students rose to the challenge and gave 100% in every race. Minor girls came 3rd in Connacht. Junior boys continued their great running form and finished first in Connacht. 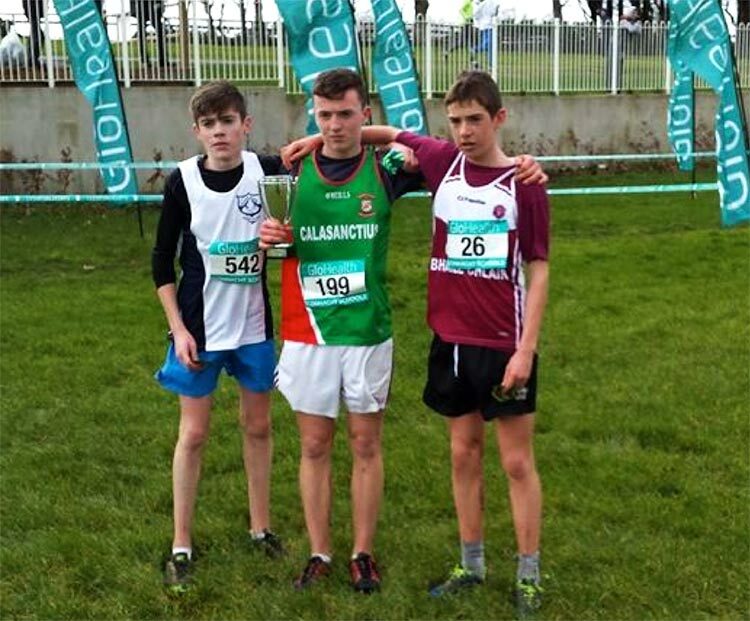 1st Oisín Lyons (Calasanctius College Oranmore), 2nd Sean O’Hanlon (Rice College Westport), 3rd Aaron Brennan (Coláiste Bhaile Chláir). Second year student Aaron Brennan came 3rd in the Junior boys final. 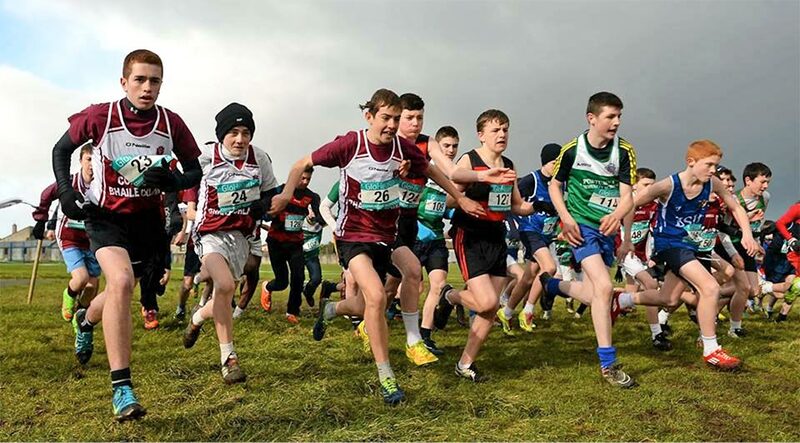 The All Ireland Schools Athletics final will be held this Saturday in Clongowes Wood, Clane, Co Kildare. We would like to wish the fifteen Athletes who have reached the All Ireland all the best on Saturday. A unique piece of history for Coláiste Bhaile Chláir occurred with three sets of sisters starting for the schools Junior girls’ Gaelic football team. Sisters pictured above L–R: Laura and Edel Flattery (Full back and wing forward), Sara and Hannah Coady (Goalkeeper and Midfield), Shannon and Amy O’Connell (Corner forward and wing forward). The match on Wednesday 25th of February was the first game for the school at this level. In association with Eating Disorders Awareness Week (23rd of February–1st of March), Coláiste Bhaile Chláir’s second year Home Economics students participated in the Be Body Positive schools programme. The Eating Disorder Association of Ireland, otherwise known as Bodywhys informed students of eating disorders, as well as ways of promoting positive body image. The Bodywhys representative conveyed to students that the majority of eating disorders emerge during the teenage years when body image and self-esteem can be particularly vulnerable to outside influences. The students found the talk very informative and it increased their awareness of this important issue. 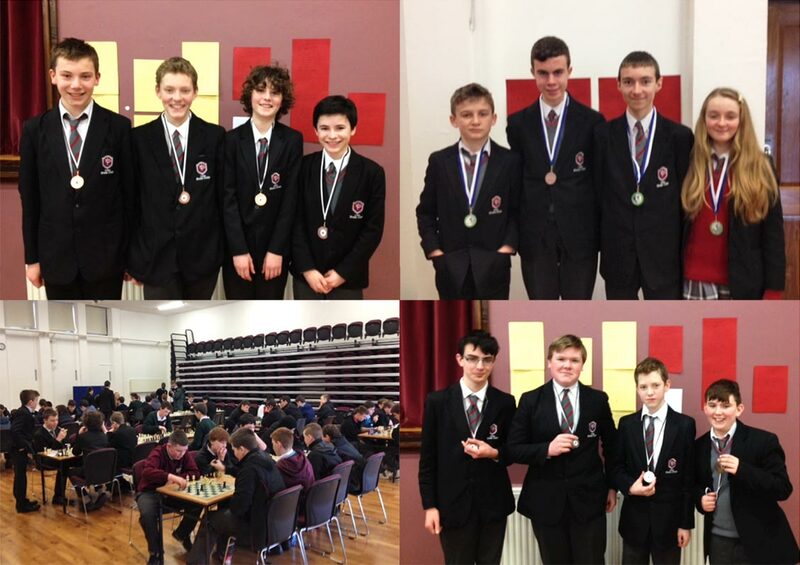 On Wednesday the 4th of March Coláiste Baile Chláir chess club entered one team in the Connaught Cup Competition and three teams in the novice competition in Moneenageisha College. 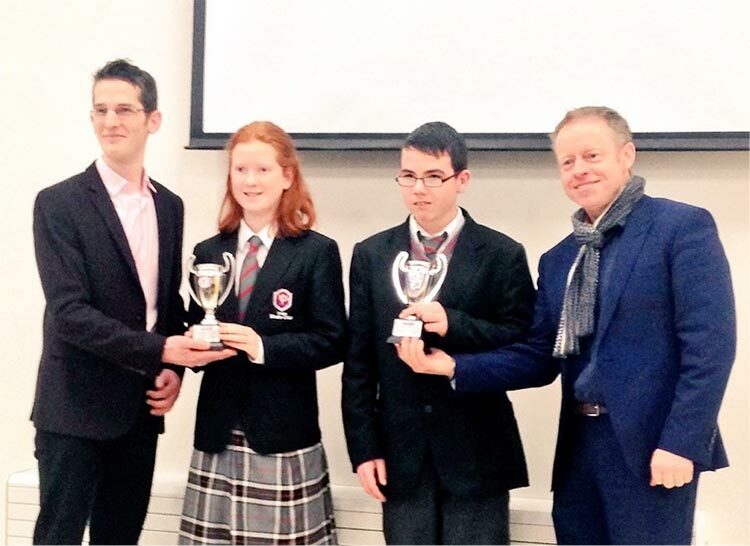 In the Connaught Cup the team consisting of Thomas McStay, Kieran Spellman, Aoife Ryan and Oisín Noone came second. While in the novice competition our B team, Killian Goaley, Matthew Mohr, Luke Roberts and Thomas Regan came second and our A team, Michael Aherne, Simon Coyle, Ethan Kaya and Luke Adams came third. Our C team, Liam Molloy, Daire Leonard, James Keighrey and Jason Folan were just half a point behind third place. 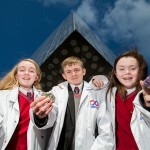 Galway’s Science Buffs Know How to Grow Their Own!